Faiz Ahmed Faiz wrote poetry in the Urdu language while holding strong political views all through his life that often got him into trouble with the law. He served a number of prison sentences because of his beliefs but it never changed him. He was a committed communist and was so highly thought of by the Soviets that he was awarded the prestigious Lenin Peace Prize in 1963 after his poems were translated into Russian and received great acclaim there. 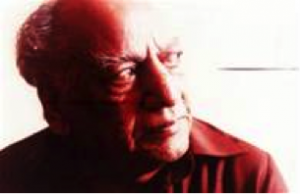 Faiz was born in February 1911 in the small town of Sialkot which was part of India at the time but is now in Pakistan. His parents were wealthy landowners so he grew up in comfortable circumstances. It was clear from an early age that Faiz would develop an interest in poetry as his father, as well as being a prominent lawyer, held membership of an elite literary circle. The poet laureate of Pakistan, Allama Iqbal, was also a member of this group. Faiz enjoyed the best education available and was a model student. He studied several languages and obtained a BA in Arabic, MA in English and then a second master’s in Arabic followed that. He went into teaching following graduation, starting out in Amritsar and then at a college in Lahore. It was here that his style of writing migrated from light, romantic subjects to more serious themes of politics and community matters. In 1941 he married an ex-pat British woman who had already converted to Islam and they had two daughters. A year later he joined the British Indian Army and his service earned him the British Empire Medal. His Army service ended with the partition of India in 1947 and he took up the editorship of a socialist English language newspaper called “The Pakistan Times”. The early 1950s was the start of turbulent times for Faiz and he was arrested in 1951 following a failed coup against the government. A death sentence was passed on him but, having served four years in prison, he was released. During this time he wrote two collections of poetry which reflected his life in prison and, in many ways, he considered that this period of incarceration opened his eyes to see the world in a different way. The outcome of the war resulted in the government being overthrown and when Zia Ul-Haq took over Faiz was exiled to Beirut in the Lebanon. He was to remain there almost until the end of his life. He kept himself busy writing poetry and editing the magazine “Lotus”. He will be remembered as someone who wrote in a fairly easy, conversational style and was influenced to some degree by a 19th century poet called Ghalib who also wrote in Urdu. Political and social themes were never far from this left wing intellectual poet’s work though. Faiz Ahmed Faiz died in 1984 at the age of 73 while living in Lahore. It had not been long since his return to Pakistan from exile and he was nominated for a Nobel prize for literature shortly before his death.